Tired of spending too much time searching for important documents, the pair of shoes that perfectly matches your outfit, or the kids’ camping equipment? Are you forced to purchase identical items because you can’t find the one you already own? You’re not alone. The vast majority of homeowners list storage and organization as their top two desired changes. A professionally designed and outfitted space that is customized to your specific needs is the perfect solution, combining beautiful and functional elements of organization to reflect your style and tastes. Since 1984, Classy Closets has helped hundreds of home and business owners clean up their act with customizable storage solutions. We don’t focus only on closets, either. Your garage, pantry, craft room, laundry room, or media room, can be converted into a space you’ll find restful and serene. Where clutter and chaos cause frustration and waste your time, an organizational system that is just right for you brings peace of mind, while allowing you to complete tasks more efficiently and enjoyably. Any closet, whatever size, benefits from some critical analysis. For clothing storage, it’s important that you can easily view and select outfits and shoes with ease. What do you use frequently and what needs to be stored out of the way? Do you own a collection of handbags, shoes, hats, or other clothing articles? Can you quickly locate a special suit jacket or sweater without sorting through racks, shelves, and drawers? 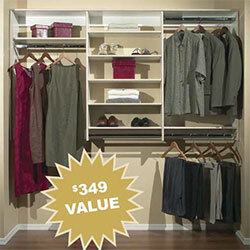 Let us help you identify how you store your clothes and determine a system that meets your needs. You will be able to select from a large variety of storage combinations, finishes, door front styles, hardware, and more to create the ideal solution for your closet or dressing room. The garage can quickly turn into a no-man’s land of dumped items, with camping gear and gardening tools tumbled over each other without rhyme or reason. Perhaps you can’t even fit your car inside for lack of adequate space! But don’t worry: help has arrived. Our endless options for durable and functional cabinets, workbenches, flooring, and more will turn your garage from the space you avoid to one that you thoroughly enjoy for its usefulness and practicality. Don’t waste the opportunity to convert what is often a large portion of your home’s square footage into effective storage. Does your office consist of a rickety desk and a couple of old filing cabinets? If you mean to be serious about getting work done at home, you need serious solutions for work and storage in your office. At Classy Closets, we are experts at designing home offices and craft rooms equipped with adequate document storage and work spaces that encourage your creativity. Pantries can be the size of a cupboard or large enough to fit a sink and work counters, but they need to utilize space efficiently. For 25 years, Classy Closet professional designers have been able to work with homeowners to create functional and beautiful pantries. Planning meals is a lot easier when you can clearly see what you have. Likewise, a laundry room is far more functional when cleaning supplies do not inhibit your ability to use the washer or dryer. From installing a few simple cabinets to multiple worktops, we’ll be happy to turn a dreaded task into a delightful job. Are you torn between having a home office and a guest bedroom? Now you can have both by incorporating one of Classy Closets’ comfortable, space-saving wallbeds. A wallbed can be tucked away when it’s not needed, opening up valuable space in the room for work or play. When a guest comes to stay the night, simply pull the wallbed down from its hiding place behind tasteful cabinet doors. Closet organization was never better.